Welcome to Down On The Street, where we admire old vehicles found parked on the streets of the Island That Rust Forgot: Alameda, California. We now have our first-ever five-time DOTS honoree: WhatWouldJesseDo. We've already seen Jesse's '66 Datsun 411, his '61 Austin Mini, his '70 Puma GT (now sold to a buyer in Denmark), and his '83 Toyota 4x4 truck. Now he's added this classic Detroit cartruck to his stable. This El Camino is in very solid, rust-free original condition, and the original Tonawanda-built 2-barrel 350 still sounds fresh. 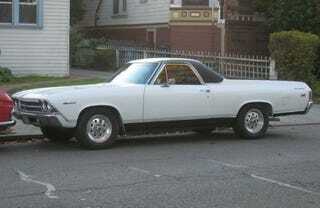 Could this be the only '69 El Camino in the world that doesn't have headers and a Holley 750 double-pumper by now? The one questionable modification that's been done to this machine might be the "vinyl top" made out of protective bed-liner coating. It looks OK and is likely impervious to meteorite damage, but just doesn't seem like a good idea. I'm not enough of an El Camino expert to know whether the proper term for this one is "El Camino Malibu" or something else; the '69 El Camino being a Chevelle with a truck bed meant that the Chevelle's Malibu trim package was an available option. Any of you experts out there got an opinion on the subject?